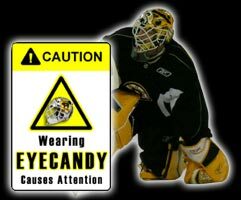 Are you a goalie that wants to express yourself and stand out in a crowd? Are you looking for a goalie mask design that is as unique and individual as you are? Are you looking for art on your goaliemask - as opposed to just colour or some off the shelf stock paint design? Then the puck stops here. 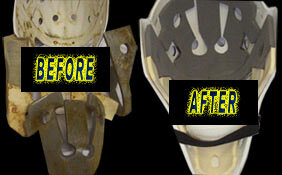 EYECANDYAIR specializes exclusively in Goalie Mask and Helmet Airbrush Painting!! All commissions are hand painted/airbrushed personally by renowned hockey mask artist Steve Nash "The Goalie Mask Specialist". Steve is extremely passionate about the art he spends time to create and therefore uses only the highest quality paints and products to render his eye-catching masterpieces. Completed airbrushed works of art are then protectively sealed with a high gloss clearcoat to help protect the artwork and minimize damage from any "battle wounds" that will occur during the game. Click on the painted goalie mask image above to check out the EYECANDYAIR MASK PORTFOLIO SHOWCASE and view all the airbrushed masks and helmets Steve has previously had the pleasure of painting for our goalies. Your goalie mask smells sooooo bad that you find yourself sitting alone in the corner of the dressing room. Players refuse to cross the blueline- including your own defense! Quit concentrating on that nasty odor and focus on your hockey game with a mask cleaning and sterilization package that will leave your padding with a NEW refreshing smell and bacteria free.